You can read part 2 of this series here and part 3 here. So, you live on a homestead and raise your own meat. That’s great. You get extra self-reliance points if you butcher the meat yourself. But, your journey to a sustainable life, an existence where you always use resources wises and for optimal benefit, will not end before you learn how to tan hides. There are as many way to tan hides as there are animals. Odds are, you will try several different variations until you find the one that works best for your. None of the processes are difficult or involve expensive tools, but each requires both exactness and patience. I always have trouble with the patience part. Expect a lot of trial and error, when learning how to tan. Starting with small animals is best for several reasons. First, they are easier to work with, require fewer hours of manual labor to clean and process them. And secondly, when you screw up or your creative dreams surpass your current skill set, you will waste only a small amount of leather. I did not follow my own advice, but I had a good reason. I started with a cow hide it was offered to me by a butcher pal who was going to let it become landfill fodder if I did not jump on the opportunity. 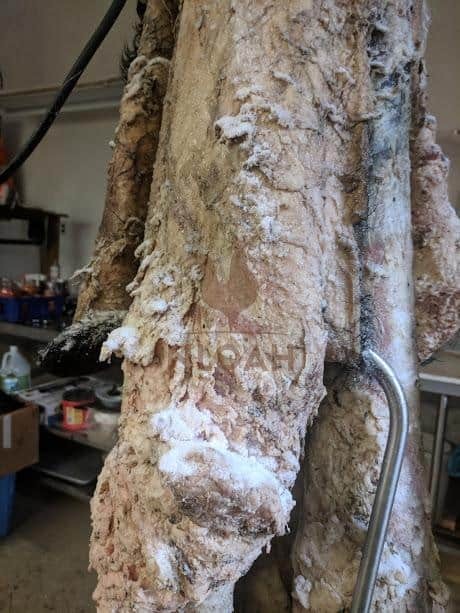 Photo: once the hide is dry after salting, the fat membranes and excess meat still attached to the flesh after butchering, must be removed before the tanning process can continue. This part of the process can take several hours when dealing with a large cow hide, like shown in this photo. This hide was from a well more than 1,000-pound Black Angus. Thankfully, I was working with a homesteading friend who had tanned hides before, and was able to pull off the mammoth chore without wasting the beautiful hides. 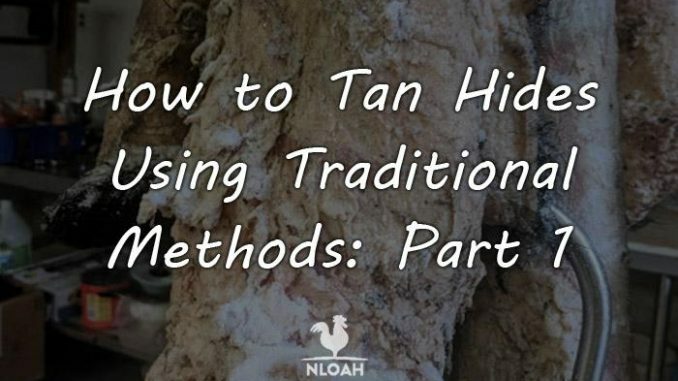 Since we are about to embark on tanning three hides, one of which we are going to tan in a manner that keeps the hair, Dan and I decided writing a how to tan hides series to create a step-by-step guide for the New Life on a Homestead community, was a stellar idea. Tanned hides are primarily use for clothing, outerwear, and boot by choice and for saddles, and tack, in our modern world. But, the processing of pelts of both wild animals and livestock was once a necessity. The tanned leather was used to make pouches for carrying game, blankets, a cot to sleep upon, as coverings for animal bladder based canteens, as the only clothing and footwear material available, and to address other primitive needs. Buffalo hides were once the primary type of hide used in the making of footwear and saddles because it was so thick and durable. Before the hides can become soft and pliable leather, they must be tanned. Differing variations of this process have been used, relatively unchanged, for thousands of years. Even though there are multiple variations and preferences when it comes to tanning hides, there are really only two different types of tanning: Chrome and Vegetable. Chrome tanning is chemical-based. Nearly 100 percent of all leather goods available on the commercial market today are chrome tanned. Chrome tanning is a vastly quicker process than vegetable tanning and produces a leather that is extremely water resistant and easily dyed. The downside to this method is obvious, you are using harsh chemicals that will be touching your skin if you are making clothing, accessories, footwear, horse tack, or blankets. Vegetable tanning take more time and effort that chrome tanning, but typically produces a far more soft and pliable leather – making it a great choice of clothing construction is a part of your leathercrafting plans. The hide must be tanned and not simply washed and turned into a rug or boots, because the protein structure of the pelt must be changed to turn it into leather. The first and perhaps, most important step in the tanning process is the drying, salting, or smoking, stage. The hide must be thoroughly dry before the scraping of fat and excess meat and/or hair can be removed. Then, the skin is either treated with lime or washed (some tanners do both) and then the leather is tanned – worked to crack tiny membranes in the hide and softened with some type of oil. Photo: these are two cow hides being stored in a freezer in our butcher shop until my homesteading friend Sarah and I get done with the cow hide we are tanning first. The hides can usually keep for about two years in a freezer before you have to worry about a reduction in hide quality. Before we jump into the how to part of the series, I want to cover the tools and other supplies you will need to tan hides. You will not need everything on this list, the types of knives, boards, and scrapers used are left up to personal preference. Some of the materials are specific to the style of tanning you choose to try – as noted next to each. 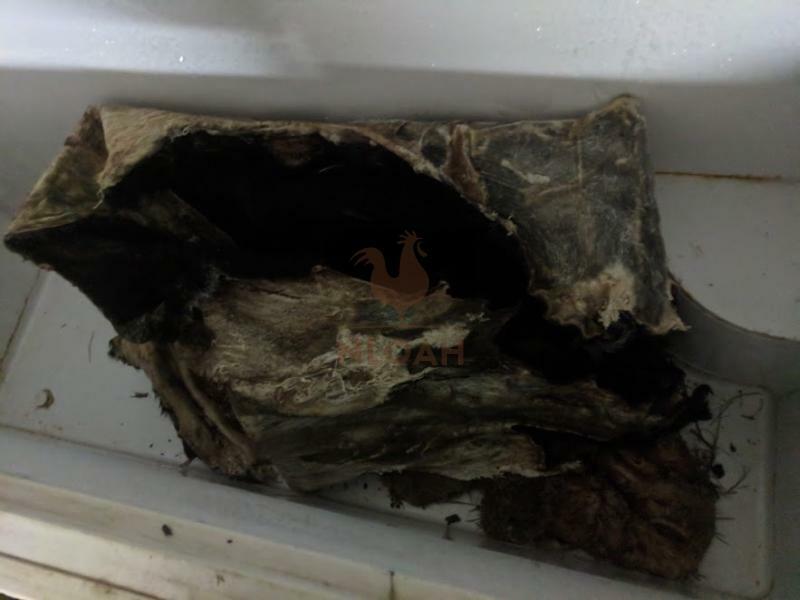 • Fleshing Beam – This can simply be a piece of board or form metal frame you can lay the hide over to scrape it and let it dry or a board cut to fit each animal type that will allow you to slide the front and back of hide between it to allow for more even drying. You can also tack a hide to the side of your wood shed to let it dry and to hold it tightly in place while it is being fleshed. Native Americans made a frame out of branches to tie the hide to for these same purposes. Because we have a butcher shop on our homestead, I simply hit a button on the overhead track and meat hooks roll my way to hang the pelt upon. • Fleshing Knife – You can also use a draw knife or a dull hacksaw blade to flesh the hide. 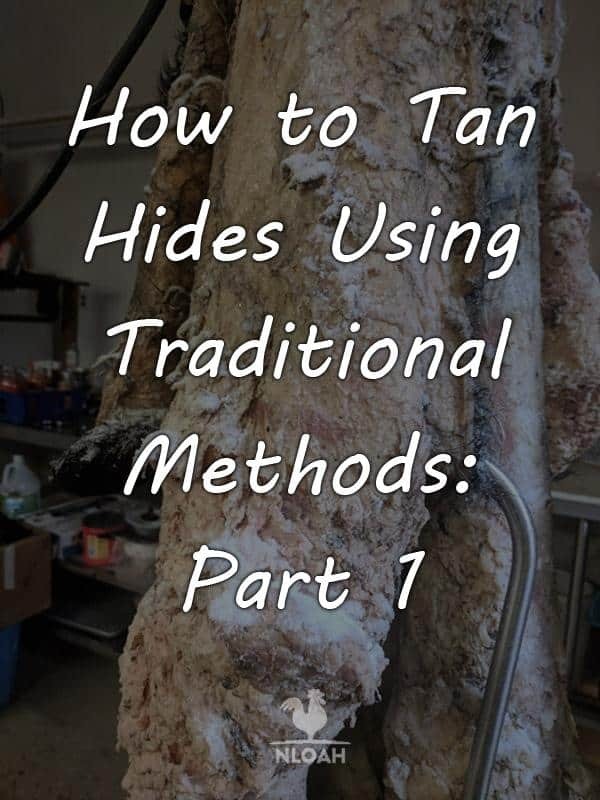 Before you begin tanning, regardless of the method you choose to use and whether or not the hair will left on the hide, you must wash and then gently yet firmly, scrape away all the blood and thick sticky goo that was left on the hide after butchering. This is a labor intensive and stinky process – you will NOT want to flesh your hides inside a garage attached to your house! Keeping the sun off the hide during the tanning process is also essential. The goo will attract predators that want to come eat it – and any other animal roaming around your homestead. Direct sunlight on the hide during the fleshing process will often make the hide become too brittle to process and work with properly to keep it pliable – in essence ruining the leather. • Pelt Scraper – This hide tanning tool has a square edge to remove the fat and meat from the hide on one side and a sharp blade on the other side to remove gristle from the hide. It also comes in handy when you are working in tight spot where there is a lot of gristle, like on the legs of cow and buffalo hides. • Pelting Knife – These knives come in several shapes and are great for when you get into tight spot on the hide. • Tail Stripper – This took is handy to have when dealing with hides that have long or bushy tails, like squirrels and raccoons. • Wire Brush – Some folks use a wire brush or heavy duty scrub brush to scrape the gristle and fat from hides. These will both work, but you will need to be gently when using a wire brush or you will tear or poke holes into the hide. Using a heavy duty scrub brush with plastic bristles will require more effort when scrubbing the hide. • Hoof File – If you have a livestock hoof file that is getting dull and needs sharpening, you can use it as a scraper or pelting knife before you file a new sharp edge onto it. • Bucket or Trough – The animal hides will need to be soaked in water to clean them. If using wood ash to remove hair from the belt, you will use a bucket or trough for this process as well. I used a 25-gallon metal livestock tank to soak a massive Angus cow hide in and it worked just fine. I had to sift the hide around a bit more than I usually due because of its bulk, but the trough still provided enough free movement for the lye in the wood ash to mix with the water and coat the entire hide. • Gloves and Apron – Native Americans and early pioneers probably did not wear gloves when they tanned hide, but I sure do. A work apron or old clothes that you do not mind ruining, are also highly advised. • Fire – If you are going to smoke the hides, you can use a metal fire ring or sawed off metal drum, to keep the fire contained and going during the smoking process. • Brains – Ironically, every animal possesses just enough brains to coat its own hide for tanning. Butchers do not usually keep the brain matter, so make sure to request its salvage if you are going to brain tan – it keeps in the fridge just fine for a few day to a week. • Lard or Tallow – Animal lard is also a great material to use in tanning. • Wood Ash – I dump the wood ash from our wood stoves into a metal trash can with a firm fitting lid all year long to make my hide tanning stockpile. Once the wood ash has cooled, it can be moved to a plastic tub, plastic barrel, or a trash bag for storage. • Alum – This is often considered a staple material for use during hide soaks. It is usually mixed with agricultural lime and water to create the soaking bath. • Salt – There is always a heated debate when it comes to what type of salt should be used and should never be used when coating hides during the tanning process. Do you own research and decide which type of salt seems like it is the best for tanning hides – and then go buy a LOT of it. Expect to need between one to five pounds of salt if tanning a medium to large hide. If the hides are not salted as soon as they are removed during the butchering process you will most likely lose the hair on the pelt during the tanning process. Pickling salt, the kind you use for canning or non-iodized salt, is usually recommended for tanning hides. You can also freeze the hides for a long time, years perhaps, until you are ready to tan them – and negating the need to salt, clean, and hang them all right away after butchering. • Baking Soda – Baking soda is also often mixed with water and/or other ingredients by tanners for use during a softening soak. It is also used to reduce moisture and draw out excess chemicals in some tanning recipes. Borax, bran flakes (yes, the cereal) and raw eggs, are also commonly used by tanners when processing leather naturally. • Neat’s Foot Oil – This product has been manufactured for decade and often used by tanners when they are working to soften the hide into a soft leather. You can also use the same Mink oil you rub onto your saddle and tack, coconut oil, olive oil, or cooking oil for the same purpose. • Wood Stick or Metal Pipe – You will need something long and durable to use as a stir stick to move the hide about in the water during a soak to make sure it is thoroughly treated in your chosen materials. My stir stick is a 4-foot club that I found laying in my Hubby’s junk pile. If the hides are not frozen when you bring them home from the butcher, lay them out as flat as possible in the back of a pickup truck and salt them. NEVER ever, leave the hides in your truck bed overnight. They smell of the flesh will attract predator and you will awake the next morning to find a pack of coyotes gnawing on what would have become your new leather coat, saddle bags, or fur rug. If a lot of the salt is shaken loose during the ride home, apply more salt. You want the hide to be as amply salted as possible. The salt draws moisture out of the hide. You will almost always see pools of both liquid and fine skin beneath the hanging hide while the salt is doing its work. How long salted hide is hung will depend upon the condition of the hide and the weather. It can take as little as a few day up to a couple of weeks for it to get good and crispy. Photo: some Native American tribes chewed on the hides to break up the membranes and make them more soft. 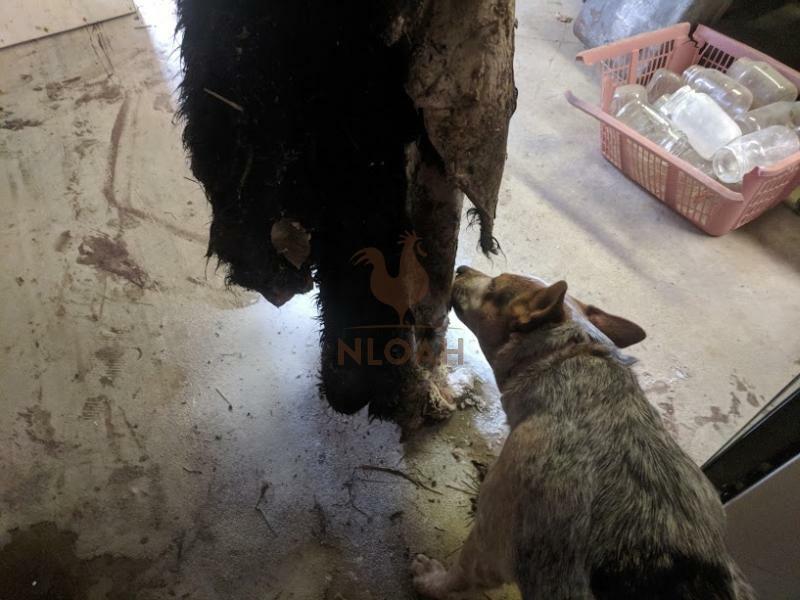 I am never going to do that, but Jovie, my Blue Heeler sidekick, likes to gently nibble on all the fat and meat left on the hides, so I will leave the traditional softening technique entirely up to her! This recipe is designed with ingredient amounts to tan 10 rabbits, four deer hides, one to two cow hides, and six medium-sized hides, like from a raccoon or groundhog. I have seen the results of this tanning recipe and the leather turns out great, I just personally prefer not to use chemicals when tanning, or on my homestead, in general. 1. Soak the hide in clean warm water for several hours to make sure it is flexible. 2. Boil the three gallons of the water you have set aside. 3. Pour the boiling water over the bran flakes. 4. Allow the mixture to settle for approximately 60 minutes. 5. Strain the bran flake and save the brownish hue brine solution. 7. Pour the salt into one o the plastic trash cans. 8. Pour the boiling water over the salt and stir it constantly until it dissolves. 9. Pour the bran flakes brine into the same trash can and stir. 10. Once the water cools to a Lukewarm state, CAREFULLY pour in the battery acid. You MUST wear protective gloves, keep your arms covered, and only do in the outdoors or an extremely well-ventilated area. Covering your eyes with protective goggles and putting a mask over your mouth and nose is also highly recommended. 11. Stir the battery acid both thoroughly and carefully, making sure that it does not splash out of the trash can. 12. Peel the inner dried skin off o the animal hide if using a fresh skin. 13. Put our skin(s) into the solution. 14. Carefuly press the skin down to make sure they are all thoroughly coated and entirely saturated by the solution. 15. Let the hides soak in the solution for approximately 40 minutes – stirring occasionally. 16. Before taking the hides out of the solution, fill the other trash can with warm water. 17. Using the stirring stick, move the hide(s) out of the solution and into the trash can filled with clean water to rinse them. 18. Stir (or slosh, really) the skins in the rinse water for at least five minute to make sure all the salt that was on the skins has been removed. If the water gets dingy and the hides have not soaked long enough or still have a presence of salt, dump the trash can and fill it with clean warm water again. 19. Pour the baking soda into the water to neutralize as much of the acid on the hide as possible. This will help reduce the possibility of any battery acid in the hide irritating the skin when the leather is worn. Baking soda may have a negative effect on the leather preservation, but it is a commonly used ingredient in many tanning recipes. If the hide is going to be turned into a wall hanging or a rug that children and pets will not be laying upon, you might want to skip the baking soda step. 20. Remove the hides from the rinse water – this may take two people, they will be heavy. 21. Hang the hides up over a board, shed, etc. and let them drain and begin to dry. 22. Use a rag or paint brush to rub your chosen oil onto the hide while it is still damp. The oil should be absorbed into the pelt rather quickly and not leave much of a residue. 23. Now, stretch and nail the hide onto a board, frame, or shed – wood pallets word great for smaller hides, and let it dry completely. Choose a spot in the shade, never place a drying hide in direct sunlight. 24. Dispose of the tanning solution carefully. If you pour several boxes of baking soda into the solution to neutralize it, a possibility toxic gas will be released as the soda causes a froth and bubbles to form on the surface of the mixture. 25. Check the state of your hide each day – several times a day if possible. When you decide the skin is dry at the center, even though it may still be a little soft and flexible on the sides, take it down from the stretcher. 26. Using a wire brush or your chosen tool, go over the skin (lay the hide fur side down if you left the fur on the hide) to soften the leather. This will usually also lighten the color somewhat. Only brush heavily and frequently over each spot if you want a suede-like appearance to the leather. 27. All the skin to remain laid out to dry for at least another 24 hours before working the leather. 28. Once the leather is dry, you need to work it with your hands to break up all of the little membranes. The leather will get a distinct white cast to it as you work each little bit into a soft leather. Many tanners put a light coat of oil on the leather once they are done and let it dry again before working with it on projects. Battery Acid!? I’ll be waiting on part 2! Thank you for this. I’ve been wanting to learn this for a while now. I know right, battery acid…jeesh. I am still working on the cow hide in the photo, but it is almost ready for the tanning process. Parts 2 and 3 to the tanning series should be published soon, followed by the tanning and then sewing parts – as soon as I get that far and my hands stop feeling so sore from all the scraping and de-furring, lol! It is not a hard process, just one that requires the following of directions, proper timing, and a lot of hard but fun, manual labor!